Yes, in this case, it really is all about the bike. Touring bikes are actually quite rare. Well, at least purpose built ones are. Most non-cyclists wouldn’t see the difference between a touring bike with drop handle bars and any other ‘racer’ but they really are a different species. Firstly, they are usually made from steel rather than aluminium or carbon fibre (yes I know there are titanium ones) and secondly they are subtly different in geometry. Both the material and the geometry contribute to the more relaxed and less hurried ride that you get on a tourer. The steel adds a bit more flexibility while the more open angles of the frame soften the ride by creating more give in the frame. Steel also has the advantage of being easily welded in just about any garage or engineering workshop in the world should you be unlucky enough to break your frame whilst on tour. Uncommon, but not unheard of. 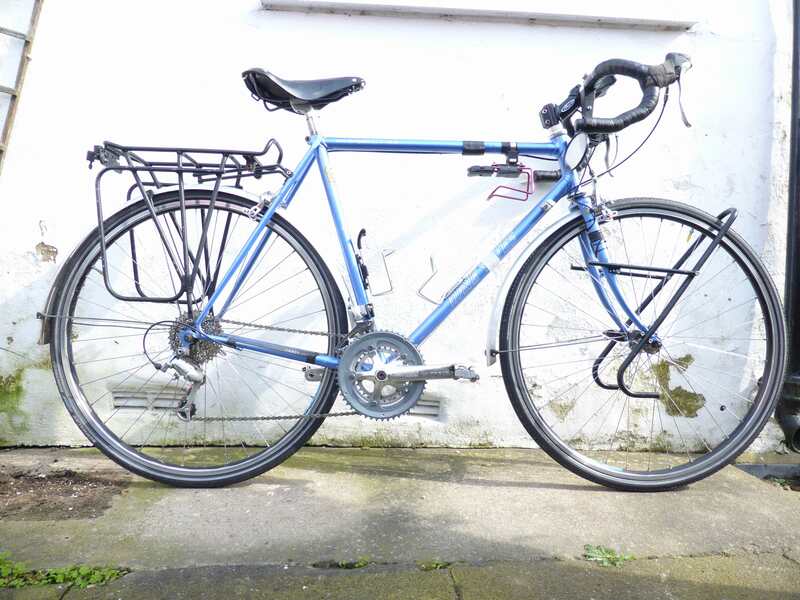 The other difference in the basic touring frame is that it will have specific brazed on mounting points for pannier racks and maybe extra bottle carrying mounts. Other than that it all comes down to the components used to build up the bike. 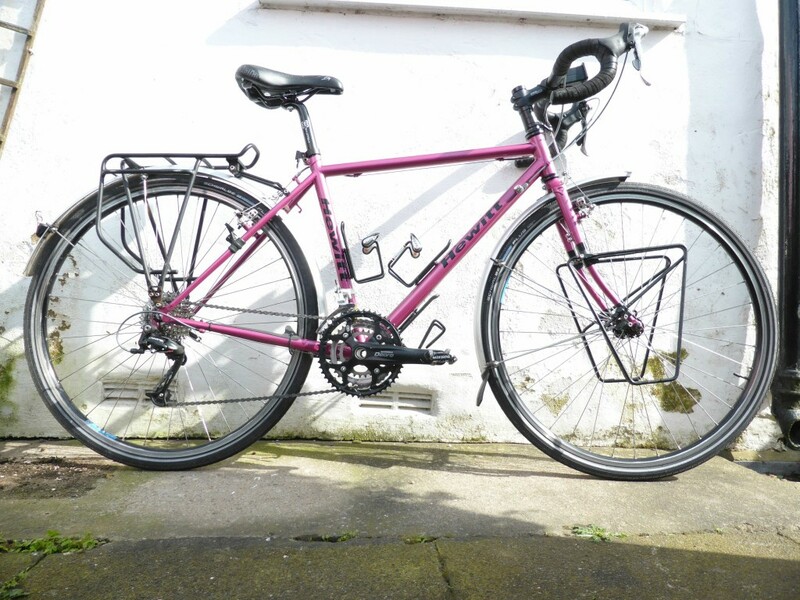 Tourers need sturdy wheels that will take heavy duty tyres and carry loads of weight and they also need plenty of room to fit full mudguards. They need very low gearing to be able to drag all that weight up the hills and most importantly, a saddle that is comfortable for up to eight hours at a time. Handle bars tend to be a personal preference so straight, drop and butterfly bars are all commonly used. Finally, one of the joys of touring bikes, in my opinion, is that they nearly all come with fascinating home made bodges and workarounds that make them unique to their owners. My bike is based on a hand built frame made to my own measurements and specifications by Dave Yates. Dave built around 12,000 frames for his employers, M Steel Cycles before setting up his own business. He knows a thing or two about frame building. Material is Reynolds 531. Hand built wheels using ST19 rims on Shimano 105 hubs. Bars – drop. Cheap off EBay. Can’t remember what they are. Both bikes have been to Colin Gardner The Bike Magician for a Gold service before the trip which involves stripping back to the frame and servicing/replacing every moving part. They both now ride like a dream. Thanks Colin.